Growing strawberries naturally for the tastiest, healthiest berries of all! Growing strawberries naturally is a deeply rewarding experience. Remember summers filled with the taste of tender, juicy, sweet strawberries? Those fresh, juicy, red berries had that potent fruity smell and the sweet and mouthwatering flavor that made the work of picking them so worth it. Growing strawberries is a chance to recreate the magnificence and splendor of all those delicious moments. While there are many varieties of strawberries there are three groups with different fruiting habits. There are the June-bearers, the Everbearers and the Dayneutrals. Of these three there are northern and southern varieties. Not only do all these varieties bear amazing fruits but they also bear amazing names like Sparkle and Sunrise. Who can resist eating berries with names like that? Let's take a closer look at these groupings so you can decide which ones you want when you start growing strawberries. Northern Varieties: These varieties will need a time of rest because they are dormant and grow very little during those short days of winter. Southern Varieties: These varieties do not need a rest time during the winter because they are robust enough to form buds in late fall, winter and early spring. They are also resilient enough to endure high temperatures. June-bearers: True to their name they produce fruit in June. They are very industrious plants and characteristically produce a large crop. Many people prefer these berries because they come at the start of the gardening season so preserving them comes before the big harvest of other fruits and vegetables through the summer months. Ever-bearers: This variety will give you a crop twice, once in the spring and then again later in the summer. The benefit here is that the berries you get are spread out over a longer period of time so you can enjoy them fresh for longer. They will give you more of a medium crop. Dayneutrals: This variety produces fruit from spring all the way through to the fall. You may get two main crops a year but you will get berries spread throughout the season. Make sure that you pick varieties that are cold hardy for your area. When picking varieties, take into consideration the size of your garden and how you want to enjoy your strawberries. When growing strawberries, remember that these plants like to be in full sun and enjoy cool nights in order to produce their fruit consistently. Their flavor and firmness proves it. Pick a site or garden bed that has been free of grubs or any fungal diseases. Strawberries are highly vulnerable to a fungal disease called Verticillium wilt which can lay in the soil for many years. Knowing about plants includes cultivating awareness of what soil plants thrive best in. Although strawberries aren't overly picky, they do love well-drained loamy soil because they have shallow roots and don't like to hang out in wet, heavy soils that might carry root diseases. They can also die if wet ground freezes in the winter. That said, build a raised bed to help the soil dry out in the spring. This will help you get an earlier start on the gardening season and buffer your plants from frost damage. Make a gradual slope on your raised bed to ensure soil runoff during rain and watering. Be mindful of insects like the strawberry root aphid and white grub by not planting on a recently cultivated area. There are many places you can buy strawberries from in early spring which is the time to get them in most areas. If you're in a southern area you could also get strawberries in the fall. Nurseries are great because the people working there will usually be able to tell you about the varieties, if they will grow well in your area, how they are different from each other and what they need in order to grow well. I also recommend nurseries because you can see the plants and spend some time with them, select them in person and take them home immediately. Picking them out in person is an opportunity to fine tune your awareness to the subtleties of the plants. Select plants with roots that are fresh and vivid in color. Leaves should be bright green and not wilted. Once you're at home with them, keep them cool and moist until the moment you're ready to plant them. One good way to do this is by putting them in a plastic bag in the storage bin of your refrigerator. Treat them as your friends and take care of them. Plant them when the temperature at night is above 25 degrees F and after danger of frost has passed. Turn your soil a couple of weeks ahead of time. For early fruit plant them sloping to the south. For later fruit plant them sloping to the north. Water your strawberries as soon as you have planted them. Depending on the conditions of your soil or bed when you begin planting your strawberries, make sure you clear the soil and site of weeds before planting. When the moment comes to gently place your plants in the ground, make sure you dig a hole spacious enough to hold the roots vertically rather than packing them in the ground tightly. Enjoy this delicate process knowing that delectable berries are coming your way. Most strawberry plants develop runners. Runners are horizontal stems that travel above the ground and grow new plants among their mother plants. 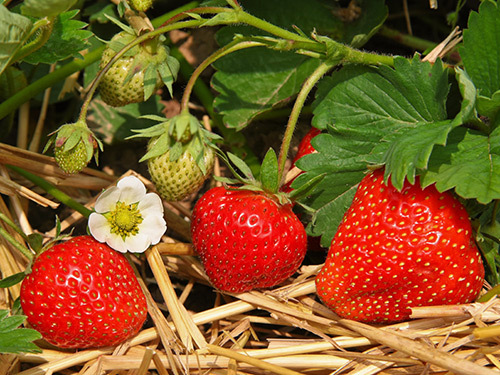 Because strawberries are perennial plants (they come back year after year), matted rows of strawberry plants can often yield bumper crops that will establish new plants. Down the road this will save you time and money getting new plants in the future. On the flip side, these plants can sometimes grow to be invasive and take over your entire garden bed. The solution is to dedicate a bed that is rich in organic matter solely for growing strawberries. Prune the runners from time to time so their creative energy is going towards making larger fruits. Let's paint a picture of what the day would look like when you place your plants in the ground. It's an early spring day and there you are holding your moist plant roots in your hands. It's overcast. The air is cool. You can feel the soil is moist on your knees when you kneel down to begin your planting. You trim off the dead leaves making sure to leave one or two on each plant. You steep the roots in water so they'll stay moist. Then you pull out your small shovel or trowel and make a hole in the ground, pressing it back and forth to make the hole big enough for the roots. Gently you place your plant in. As you spread out the roots, you begin to firm up the soil around them, leaving no air holes. Lastly, you pour at least a pint of water over each plant all the while envisioning growing strawberries that will bear the most delicious berries in the world! There are a couple of different ways you can space your strawberry plants. You can plant them in ribbon rows or matted rows. Here's a simple description of the two so you can take this into consideration when you start planting. Matted rows: For June and Ever-bearing plants, space them 18-20 inches apart from each other in rows that are 3 feet apart. Only allow 4 - 6 runners to develop from their mother plant and beyond that, prune the other runners that develop. For Dayneutrals, space them 9 - 10 inches apart from each other in rows 3 feet apart. Remove all runners. Let these plants form matted rows during the 2nd and 3rd growing season. Matted rows are the easiest to start and sustain. Ribbon rows: Plants should be spaced 5 - 10 inches apart from each other in rows. While ribbon rows develop fewer runners, you still need to cut any runners from the mother plants during the growing season. Ribbon rows can produce fruits in a short amount of time and are best for Dayneutrals which grow few runners anyway. If you don't want to begin growing strawberries with these specifications in rows, you can also grow them in the hill system. You would plant them 10 - 12 inches apart from each other in rows with 12 inches in between each row. The hill system is good to create because they will produce large berries and if you have less space for gardening, every big berry counts! So you've planted your strawberries. Now begins the joyous work of tending to them. There are many ways to water your plants. You can water by hand with a watering can, you can use drip hoses, sprinklers or irrigation furrows. No matter what form of watering you employ, regularly water your plants at their base. Ideally, water in the morning so the plants have time to dry before night, thus, reducing chances of acquiring diseases. You want to keep the soil evenly moist but not saturated or soggy. 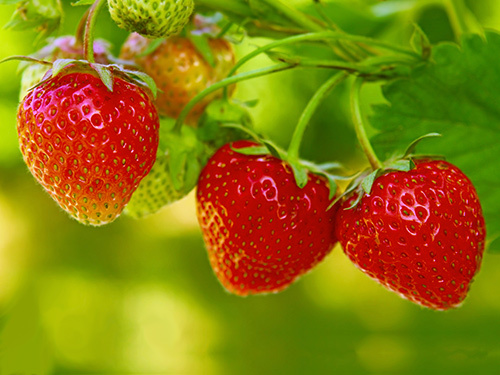 Strawberry plants need water when it is especially dry because of their shallow roots. Be careful of watering when it is windy out. A lot of water can be lost through evaporation during breezy days. Adding compost to your strawberry plants is a fantastic way to fertilize them. There are so many things that composted manure does for the soil. It gives it added nutrients gradually over time and adds organic matter where it might not have been otherwise. Just remember to not fertilize when you initially plant them and whatever fertilizer you choose, make sure that it is free of herbicides and pesticides. Use composted over fresh manure to avoid salt build up and causing too much heat on your plants. If your strawberries are thriving with dark green leaves in summer, it's likely you don't need a lot of fertilizer. Meager plant growth will tell you how much fertilizer you need to support their growth. You will need to give lots of care and attention to your plants in the beginning in order to help them grow. In your first year of growing strawberries, you want to support leaf, root, and crown expansion so if you have chosen June or ever-bearing plants, pinch off the flowers from your strawberry plants. For the Dayneutrals, pinch off flowers in the first year only until the end of summer. Your strawberries will need weeding in order to get quality berries. A simple way to keep your weeding time down is to mulch around the plants. Mulching is when you lay down a layer of material on the soil's surface surrounding your strawberries, not on them. You could lay down clean saw dust, small grain straw, marsh hay, and nonporous plastic sheeting or weed-barrier fabric. Connecting to nature can also give you the opportunity to think outside the box. Instead of buying materials for mulching you could also gather those materials right from nature. Mulching materials could then be pine needles or ferns. Mulching also is a protective mechanism for your plants such as frost damage. Strawberries can also die in alternating freezing and thawing weather or when temperatures are 20 degrees or lower. If you live in a cold climate, lay down 3 to 4 inches of mulch. Strawberries probably need less mulch in warmer climates. In Permaculture, mulching is a gardening method that imitates the process that is already going on in nature. Mulching is primary and essential. Applying this perspective of Permaculture by mulching will keep weeds out of your garden beds and it will also keep your berries clean, enrich the soil, reduce soil erosion, store moisture in it and create an overall productive environment in your garden. You've done a great job growing strawberries. Now it's time to eat them. Remember that maximizing the quality of your fruit comes from gathering them in the early morning. If you need to store your berries for more than an hour or two, pick berries when they are dry, not wet, so they don't get soggy. Always handle them carefully. When you pick the berries, pinch them gently from the stem, ensuring the stem and cap to stay connected to the berry. This helps your berry to stay fresh longer. Gather berries every 2 - 3 days in containers that are not too deep. Berries can get very heavy when laid on top of each other. On hot summer days you might need to gather berries every day so they don't spoil or over ripen on the plants. Once you've picked them, cool them immediately. You don't want to increase your chances of the berries spoiling. You can put them in the cold storage bin of your fridge or a chilled cooler. Only wash your berries after picking if you are going to enjoy eating them right away. The more leaves on your strawberries plants indicate the more fruit you will have come harvest time. Remember that fruits come in the second year for strawberry plants so be patient and remember that when you are tending to your strawberry plants you are actually tending to a cycle. Strawberries teach us this all the way through their life cycle and even after they are picked. There's could be moments of problem solving that needs to happen when growing strawberries. Permaculture invites us to get creative about where we live with the resources we have. If you find that growing strawberries in beds isn't possible, you could grow them in a barrel, a pyramid shaped bed, a window box, flower pots or even a trellis. It's easy to prune and/or train the runners by pushing them down into the soil where ever you want them to grow. There's a variety of birds, bugs and insect predators who are stalking your precious strawberry plants. Never fear. 99% of your work is awareness of them. Some insects are small, like aphids and spittle bugs, many are quite distinct like the dark black strawberry weevil, the strawberry leaf rollers that roll up into the leaves, shiny slugs and hard-shelled snails. Let's step onto the path of Permaculture for the answers for how to handle this. Permaculture design tools tell us that the problem lies in the solution. Bill Mollison, considered the 'father of Permaculture' is known for saying, "You don't have a slug problem, you have a duck deficiency!" If we see the problem as a resource to be used beneficially we can see that ducks will save us time and energy capturing snails and slugs from the garden. For ducks, snails and slugs are a fine delicacy. I have no doubt that if you pour yourself into the practice of discovering how to grow strawberries, you'll not only be able to feed and nourish yourself and others but you'll gain a wealth of fruitful learning that you can apply to all the rest of your gardening life. Here are 5 more reasons why growing strawberries gives you a profound and lasting connection with nature and yourself. There is both an unmatched simplicity and versatility to strawberries. Pop a few in a smoothie, toss them in salads, add to a dressing or just eat one fresh. There's bliss in knowing these berries bring out the best in enjoying fresh healthy food. Strawberries awaken our senses in many ways. From their fragrant aroma to their red sheen, their juicy taste and the heavenly lightness of their weight in your hand symbolize the promise of love and perfection. There are many medicinal benefits of strawberries. They boost bone health and brain function, lower blood pressure, help heal cancer and treat arthritis. Of all the people I have met in this world, not one has disliked strawberries. There's a universal teaching in that. Strawberries are eternal. Growing strawberries offer us not just physical nourishment but food for the soul as well. I have many fond memories of strawberries and I'll bet you do, too. Truth is, they're memorable for a reason. They're a time piece marking our awareness of spring's transition to summer. By growing strawberries they invite us to pay attention to the subtle cues in nature by watching how and when they grow and give fruit. Strawberries are a classic fruit. For many farmers and gardeners, growing strawberries is one of the most loved and prized of all the gardening rituals. Many a day I've been to a farmer's market and seen people light up at the sight of growers bearing these red delicious berries. Growing these unforgettable fruits will enhance not only your taste buds, but your sensitivity for other things that are sweet, too, like what's most important in life, sharing and connection. It's these kinds of values in food like strawberries that bring people together. There are many books, magazines and periodicals that feature this timeless fruit and describe how to grow them. Here are a few additional resources to further your course in growing strawberries. I'll see you in the garden! Interested in being personally mentored in Permaculture & Regenerative Design, on a transformational journey of connection to nature, community, and self?